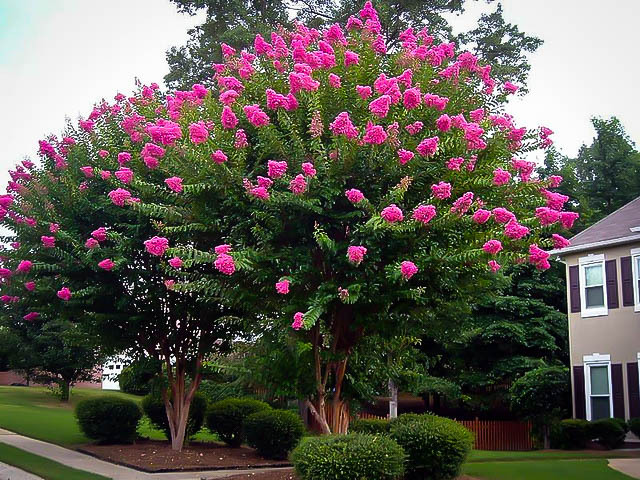 Dark Pink Color – When it comes to summer color for hot areas, Crape Myrtles are the top pick. With their remarkable drought hardiness and ability to thrive in difficult locations, they give everyone the chance to have a colorful garden during the summer months when outdoor activities are at their height. The Sioux Crape Myrtle is an exceptional small tree ideally suited for smaller gardens because of its upright habit. It makes the perfect lawn specimen, screening plant or background shrub. With its continuous blooming in a delicious shade of pink that is bright without being loud, the Sioux Crape Myrtle is an ideal choice for softer color schemes. It will blend well with just about any other colors, especially richer reds, purples and vibrant pinks and its continuous blooming will give you real value from this plant. Crape Myrtles never cease to amaze with their variety of colors and forms. Modern breeders have produced plants of all sizes and shapes, with a wide range of colors. The Sioux Crape Myrtle is a great choice for a medium-sized tree that will fit well into a smaller garden as a lawn specimen, or in a larger garden as a screening plant – imagine a row along a fence – or as a background tree behind flowering shrubs. 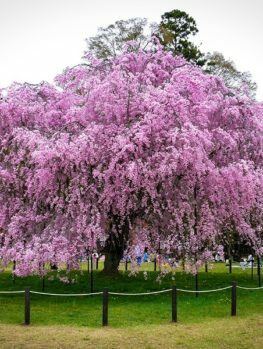 With pruning it can be made bushier, but its natural growth produces an upright tree reaching 15 or 20 feet. 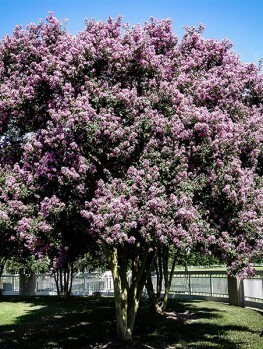 It is less bushy and more upright than many other Crape Myrtles, meaning again that it fits well into a smaller garden. The great thing about Crape Myrtles is their ability to survive adverse conditions. Full sun at the height of a southern summer, hard soil, drought and general urban conditions are all overcome by these amazing plants. With modern breeding programs the problem seen on older varieties of white growth on the leaves in summer has been overcome. This disease, called powdery mildew, does not kill the plants but it makes them unsightly. 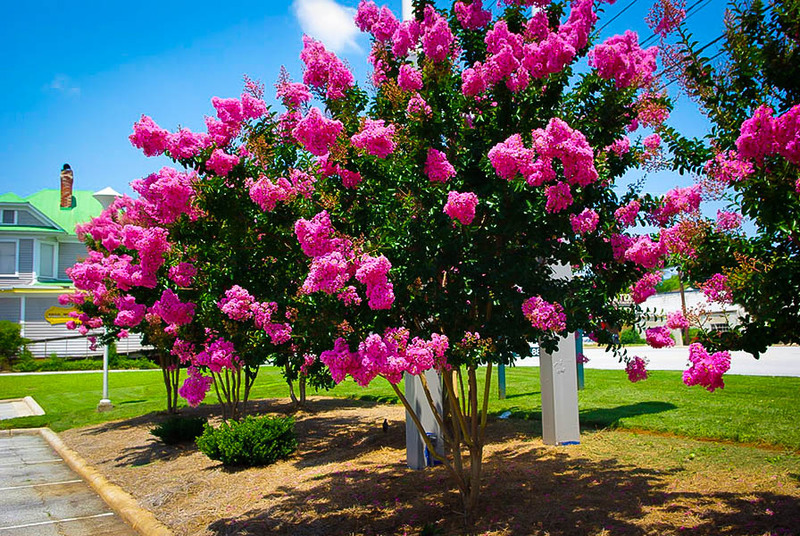 If you have been discouraged from growing Crape Myrtles by seeing such plants, then don’t worry, your Sioux Crape Myrtle will shrug off disease and stay shiny and clean all summer long. The Sioux Crape Myrtle grows between 15 and 20 feet tall and has a narrow, upright form, making it ideal for smaller gardens. The crown is rounded and oval in shape, on an upright trunk. 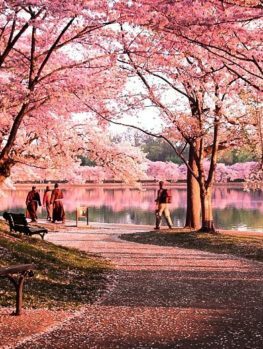 The blossoms are an attractive mid-pink – a softer color than many other Crape Myrtles, The summer foliage is glossy and a rich, dark green color, free of the disfiguring white growth of powdery mildew. In fall the leaves put on a spectacular display in rich shades of deep red and purple. The bark is light brown while your tree is young and it becomes dark olive green on mature trees. 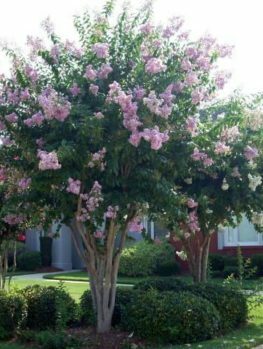 An attractive feature of Crape Myrtles is that the bark falls in patches as it ages, revealing fresh smooth, pinkish-beige young bark beneath. This is an especially attractive feature during the winter months. This plant is hardy from zone 7 to zone 9, so it will grow right across the country in all the warmer regions. It thrives in sunny spots, so choose an open, sunny location to plant it into. It will grow in all kinds of soil, from sand to heavy clay, but do not plant it in soil that is constantly wet. Because of its vigor and special breeding, the Sioux Crape Myrtle will not be affected in summer by the white discoloration of powdery mildew and it is resistant to pests as well. The Sioux Crape Myrtle is more upright than many Crape Myrtles, so when planting a screen they should be planted 4 feet apart. It is important when planting Crepe Myrtles not to plant any deeper than the containers they are in and not to cover the roots with a lot of soil. Begin your planting by digging a hole or a trench two or three times wider than the pot, but no deeper. Place your plant in the hole, replace most of the soil and firm it well down. Then water thoroughly and replace the rest of the soil, being careful not to cover the roots with any extra soil. While your plant is young water regularly, but soon, as it establishes, it will show great drought-resistance and never need any special care. As the flowers fade, remove them so that you encourage new blooms. Even without this your plant will still continue to flower continuously from early-summer up to the first frost, so stand by for a floral explosion in your garden. 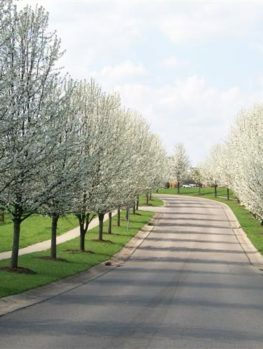 In late winter while your tree is bare, trim back the branches if you wish to keep your tree compact and bushy, but this pruning is not essential. The Sioux Crape Myrtle was released in 1982 by the National Arboretum (Washington D.C.) breeding program, which develops high-quality, mildew-resistant Crape Myrtle varieties. 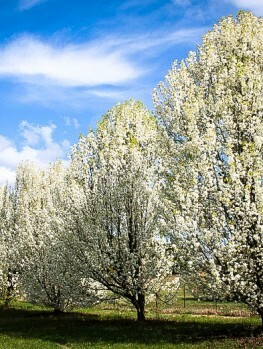 These come in a variety of sizes and flower colors and ‘Sioux’ is a medium-sized tree-form variety. 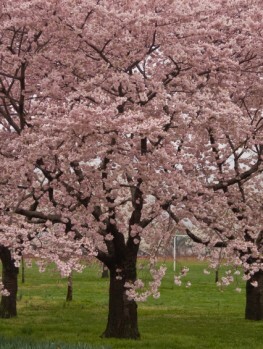 It has exceptional mildew resistance as well as clear medium-pink flowers. These Crape Myrtle varieties are hybrids of the common Crape Myrtle (Lagerstroemia indica), with a rare species from Japan called Lagerstroemia fauriei. This species gives resistance to mildew and also contributes darker brown shades to the striking patterns on the trunk. This plant has won several medals, including Florida Plant of the Year in 1998. As would be expected from its background, it has shown good mildew resistance in real trials done in natural conditions, so this is a top performer. Because of all these features and its unique form and flower color, it is important to use plants that are properly identified, when producing new plants. With the wide variety of kinds available, a plant labeled ‘pink’ could grow between 3 and 30 feet, so avoid plants with generic color names and be sure you have the properly named variety. Our plants are produced from original parent plants, by taking stem pieces (not from seed) so you can be sure they will grow exactly as described. Avoid cheaper seedling and generic plants that will be a complete unknown quantity in your garden. 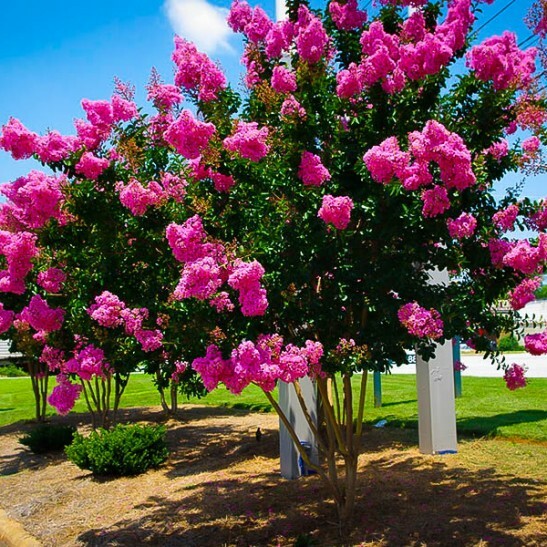 Crape Myrtles are among our biggest sellers, so although we constantly receive new shipments from our suppliers, stock can run low and even sell out for periods. 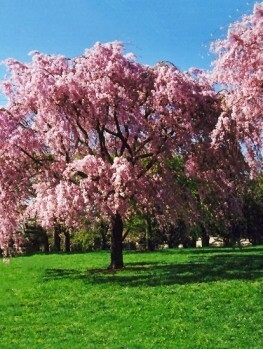 To enjoy this superb small tree in your own garden, order now to avoid disappointment.